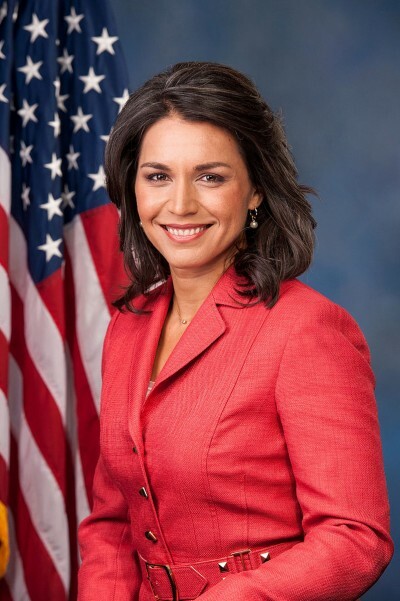 Rep. Tulsi Gabbard…introduced the Stop Arming Terrorists Act today. The legislation would prohibit the US government from using American taxpayer dollars to provide funding, weapons, training, and intelligence support to groups like the Levant Front, Fursan al Ha and other allies of Jabhat Fateh al-Sham, al-Qaeda and ISIS, or to countries who are providing direct or indirect support to those same groups. The legislation is cosponsored by Reps. Peter Welch (D-VT-AL), Barbara Lee (D-CA-13), Dana Rohrabacher (R-CA-48), and Thomas Massie (R-KT-04), and supported by the Progressive Democrats of America (PDA) and the US Peace Council. If you or I gave money, weapons or support to al-Qaeda or ISIS, we would be thrown in jail. Yet the US government has been violating this law for years, quietly supporting allies and partners of al-Qaeda, ISIL, Jabhat Fateh al Sham and other terrorist groups with money, weapons, and intelligence support, in their fight to overthrow the Syrian government. The CIA has also been funneling weapons and money through Saudi Arabia, Turkey, Qatar and others who provide direct and indirect support to groups like ISIS and al-Qaeda. This support has allowed al-Qaeda and their fellow terrorist organizations to establish strongholds throughout Syria, including in Aleppo. That is why I’ve introduced the Stop Arming Terrorists bill – legislation based on congressional action during the Iran-Contra affair to stop the CIA’s illegal arming of rebels in Nicaragua. She endorses ending US interventionist practices against nations like Syria threatening no one. Her measure is a courageous act going nowhere in neocon infested Congress.